I live in the Pasadena area of Southern California, which is an inland coastal valley, Mediterranean climate. My mother gave me my interest in plants and gardening by starting me off planting radishes when I was about 7 years old. In high school in Austin, Texas, I got very interested in fruit trees and tore out all the trees at my parents' house and replanted them all with fruit or nut-bearing trees ("edible landscaping"). Since I wanted a variety, I ended up researching every edible fruit that would survive and produce in that climate. That got me wondering why some species, such as Citrus or Avocados, weren't grown in that area. Which got me interested in both weather and climate, as well as, "rare fruits". This led me to joining societies of like-minded people that happened to exist. (Which was also a revelation to me.) During graduate school, I couldn't grow a vegetable garden, let alone fruit trees. But I had to grow something ! However, it had to grow in pots. Also, I was now in northern California and knew that the climate allowed for many unusual (to the rest of the U.S.) things to be grown. This somehow led me to bulbs. I started branching out. Then after grad school, I ended up in southern California, and one weekend I was at the Los Angeles County Arboretum and there was this group there showing off all kinds of flowers from various kinds of bulbs that I had never seen before. A guy named Charles Hardman handed me a card and told me that I ought to join the International Bulb Society (IBS), which I did. They had an email forum, that I joined. Cathy Craig was on it and started up something called the BX. I ordered a few bulbs, and the rest was history. Now my wife thinks I either ought to open up a botanical garden or a nursery. And I have way too many pots of things to take care of them properly like I should. However, I have contracted the permanent illness of bulb-lust (along with another permanent illness that I call the travel virus). Since both are chronic illnesses, I have to treat the symptoms by periodically hiding my checkbook and my credit cards. 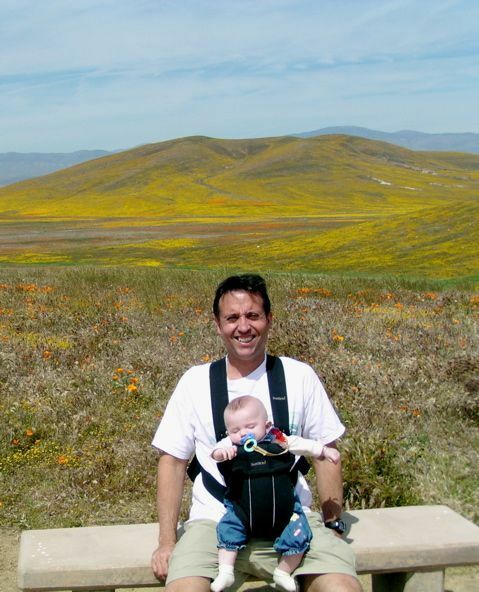 Photographs below of Lee Poulsen and his family taken in the desert during the amazing wet spring of 2005. 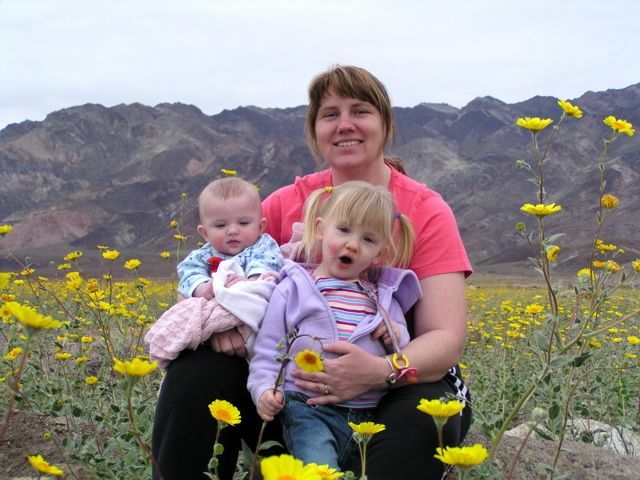 The first is of his wife Angela, and daughters Emma (2.5) and Isabella (0.4) taken in Death Valley mid March 2005. 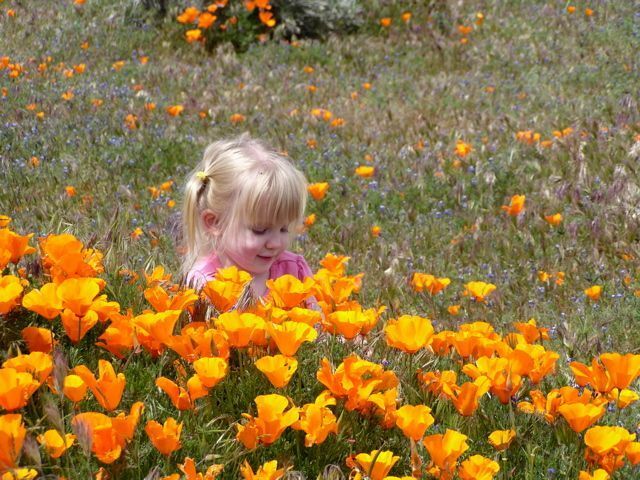 The next two of Lee and his daughters were taken at the Antelope Valley California Poppy Reserve on the western edge of the Mojave Desert outside of Lancaster, California on April 2, 2005.